Cryptomundo » Mystery Tracks: What-Made-’Em? What kind of animal made these tracks? Bigfoot? Windigo? Knuckle-walking Swamp Ape? Mountain lion? Dog? Cryptid Canid? Mystery Cat? Phantom Panther? These tracks were found in Pennsylvania in 2002, but the photographs were just shared with me. What do you see in them? What kind of animal left these tracks? This entry was posted on Wednesday, January 30th, 2008 at 12:01 am and is filed under Alien Big Cats, Bigfoot, Breaking News, Cryptid Canids, Cryptomundo Exclusive, Cryptotourism, CryptoZoo News, Cryptozoologists, Cryptozoology, Evidence, Footprint Evidence, Mystery Cats. You can follow responses via our RSS 2.0 feed. You can skip to the end and leave a response. Pinging is not allowed. These are a few recognitions as I glanced at the photos. 1. The animal in question is a quadruped as the front and rear tracks overlap. 3. Lastly, the bottom track appears the most catlike. Having said these things I believe my conclusion is a lame cougar or other big cat. I believe it is lamed because most normal tracks do not overlap and it is hard for me to imagine a crooked walking and still healthy animal. Wow, SharkFisher you got me convinced. Makes sense to me. Ok, so I think it is a big cat too, and I am not a professional tracker or whatever, but I wonder what the terrain is like in the immediate vicinity where these tracks were photographed. What if the cat was in one of those fast bounding like motions (front two feet land, then back two feet land), type of thing? Would that account for the front and back feet overlapping? And what would it look like if the cat happened to be changing its direction mid stride? Looks like the Black Bear track. Maybe the one that Jacobs game camera photographed. Bob cat? Lynx? But if so, certainly a very large individual. Something doesn’t seem right about the toe length. I have seen some overstep in mountain lions. Rare, but it happens, occasionally in awkward, young ones. They appear to be genuine tracks. Assuming they are real tracks and not fake, they look more like puma tracks than anything else. I suppose a very large tom bobcat could make such a track though. I examined a roadkilled bobcat a few years ago, which had front paws almost as wide as my hand. That bobcat was exceptionally large, but even his paws were not as large as the tracks shown here. Since there aren’t any claw marks in the tracks, that would rule out a canid or bear. The second and fourth pictures look like genuine cat tracks. The other photos, especially the third photo, look more like impressions made by someone’s knuckles. The excess toe length in the 3rd picture could be the result of the cat traversing a slope, hard to tell in a photo. Looks “bearish” to me. Yeah, bear is my guess. It looks like a badger track to me. A badger also places its hind feet almost on top of where it placed its front feet. I think we’ve built a consensus here; it’s definitely a puma/cougar/mountain lion, for all the excellent reasons listed above. The sheer size of the tracks rules out any cat smaller than a cougar – and it is a cat track. Still, not you typical cougar track – but a close enough match to call it as it is. hey loren everyone these do look like possible sasquatch footprints but more study research etc need to be done to the photos. good morning bill green. very interesting photos of possible sasquatch footprints. I’m pretty much in disbelief! I actually found tracks identical to these ones in a nature preserve in Riverview, FL! My father, wife, and myself were taking a short hike when we came across these 4 toed tracks in some soft sand. I used my cellphone to get pics of them. I will have to figure out a way to post them. I can clearly see claw marks in all of the photos with #4 as the exception. CvD’s badger assessment is the most probable. CvD is right, if you look out beyond the long toes, you can see the claw tip indentions. In photo #5, you may just be able to see a small portion of the 5th toe, cropped off the edge of the picture. Badgers don’t always leave that toe’s impression. If it was a skunk, that would be one huge mustelid! I think we are definitely talking a biped here, as a quadruped wouldn’t be able to use a cigarette lighter. Hmmm? Not all is as it seems here in my opinion. To me these tracks look man made. I’m thinking they are fake. sausage1, that sure is one nicotine-addict cryptid, LOL! Seriously, I have no idea. Maybe a small bear, or even a badger as CvD suggested, but I just don’t know. Bear. Or maybe the Hound of the Baskervilles. But the one on the right particularly looks like a bear track. This shows how memory works, or doesn’t. I looked at the image on top, then posted, misremembering the hand to print ratio. I now see how people are saying a puma. But the toes are funny, and I wonder what a fake puma track made by somebody would look? The mud ridge between the pad and the toes is awfully homogenous. I’m only counting 4 toes here. The badger prints I have in my references show 5 toes and very pronounced claw marks. I’m also doubting bear because the number of toes is wrong and the shape of the heel pad seems wrong. The number of toes is what I would expect for a big cat. However, in pictures #2 and #5, it looks like the front portion of the heel pad is convex. Most of the big cat prints I see (bobcat, mountain loin) would have a concave dip here. Frankly, the heel pad shape could be in line with a big dog, wolf or other canine. The indirect registration (the prints partially overlapping) is also what we would expect from a canine rather than, for instance, a bobcat. However, the lack of distinct claw marks is troubling, since all of the canine prints I can find have pretty pronounced claw marks. However, if you look at the ends of the toes on the shallower prints (such as the smaller one in photo #1) you can see what look to be claw marks. In the deeper prints, I think the claw is obscured since the foot slide forward a bit in the mud. This could also explain the oddly parallel nature of the toes (usually, you’d expect to see the outer toes splay outward). So, basically, I’m pitching large canine, possibly a St. Bernard or Doberman. It could also be a wolf, I suppose. Since black panthers have been sighted around Pennsylvania that could be it. But on the other hand Pennsylvania, has a rich history of Bigfoot reports. I disagree with the canine idea. Canines have very regular, ellipsoidal shaped tracks, with the outer toes placed farther back. A paw track of a canine is longer than it is wide. The tracks in the pictures are wider than long. They do not seem catlike to me either. Canine tracks are also somewhat longer than wide. Also with felines the pad beneath the toes is shaped like an rounded triangle with the apex pointing towards the four toe pads set in an arc above it. The pad in the photos is more kidney shaped and the toe pads more in a straight line. I’ve two books about mammal tracks and the pictures and photos in there from canine and feline species do not match with the photos above! So,although only 4 toes are visible I still go for the badger. My books also say that in a badger track the fifth toe (the thumb) is often faint. 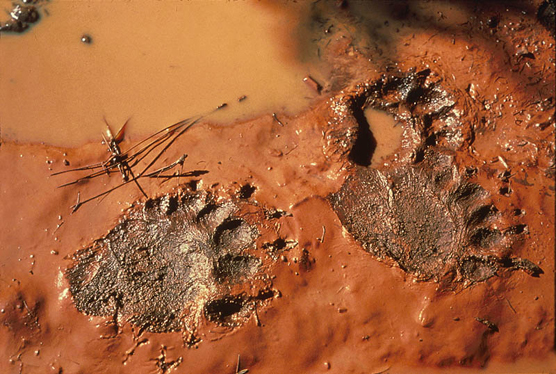 One of the books also states that badger tracks resemble those of a small bear, and the two could be confused. The tracks in the photos above seem somewhat too big to be badger, so it could be bear. But I don’t know if bear can leave a faint fifth toe in their tracks as well. I have done some research where I used inking pads for animal identification (animal walks over self made inking pad and then over paper) and I’ve seen many badger tracks. They looked very much the same as the tracks in the photos. I’m from Holland and thus not familiar with bears, so might be bear as well. They look basically catlike, but there is something odd about them, I’m not sure what. I’m no track expert, but judging from the size and location, I’d say they are most likely from a bobcat. A few people mentioned badger, but as far as i know, badgers are not native to Pennsylvania. That would make it unlikely (but not impossible) for these tracks to be from a badger. Is anybody in Pennsylvania missing a badger? I have never seen actual badger tracks, I only have books as reference. Since CvD has direct experience with badgers making tracks like this, that makes a pretty good case. I would still expect to see bigger claw markings (much bigger), but perhaps it was an escaped pet with trimmed claws. The American Badger has a range that includes the Ohio River Valley. The Ohio River basin extends into western PA. Was this photo from western PA? They look way too big for badger, not the right shape, and a badger in PA would be very unlikely, as has been noted. It’s not unusual for black bear prints to show four toes and even for the claws to not register. Looks like bear to me. As clear (including claw marks) as any black bear tracks I have seen. I agree with Bill Green. The top two photos (same print) show five toes. I did an overlay with a drawing of a black bear print from the tracking book by Paul Rezendes and saw an almost perfect match. Black Bear tracks. Cougars, bobcats, etc. don’t show claw marks because they are retracted. There appears to be clear claw marks in the photos. Bear tracks! I don’t see any claw marks. But I agree, a black bear is much more likely to be found in Pennsylvania than a puma or a badger. Still, the prints look more catlike than anything else – OH WAIT !!! They’re OTTER prints! Ummm… lookit the photos on page 128 of Meldrum’s “Sasquatch…” at the human “Morton’s foot”, with the second and third toes longer than the great toe. Then look again at the photos here, and consider the foot without the heel, as if walking on tiptoe. From what sort of slope or terrain or situation were these photos aquired? Perhaps a squatch was climbing a slope, using only the front of its foot? Provocative images! I say bear track but for those saying badger – I live in NE Penn I have never seen any badgers in this area, however I have seen EXTREMELY large skunks, as in the size of a dog. (I’m not sure how alike badger and skunk tracks would be). Most of the natural predators are gone or in limited supply so I have been noticing an increase in size in some animals, mostly skunks, opossums and ground hogs. Hope that helps. Here’s another one zoomed in on the front paw, you can see just the small holes where the claws touch. I have similar photos from the East Kootenay mountains in B.C. Canada. Cougar tracks for sure. Doesn’t look like a very big one however. OOPS! Black bear. I labeled my photo’s wrong 2 years ago. Not cougar. I’ll send anyone cougar track photos if they like to see them. But these are from a black bear. Very typical of possibly a young one as the claws are not as defined as I’ve seen before. Well, that’s not as bad as my oops above, where I totally missed one of the toes! I now abashedly agree with the bear camp…until someone points out a 6th toe! Looks like human knuckles to me. They don’t look like genuine animal prints, imo. Badger? I don’t think so. I don’t think anyone commented on the upper ridge (at the base of the toe pads) of the heal pad – looks awfully perfect for a fleshy mound, on an “animal”, walking through mud. Looks like a stamp or something to me. It’s waaaay too well defined, at least on pics 1, 2 and 5, but even #3 looks like it has an actual straight line on it. Perhaps the photographer had a little more trouble getting it back out of the mud in pic 4! Yes, knuckles and an impression-maker of some kind. I’m thinking a children’s wooden puzzle piece – a car maybe? Smudged or not pushed in at the bottom. Or a Sasqwatch, on it’s tippy toes, with a great pedicure, who smokes like a chimney. While golfing on the 4th hole at Summerfield Golf Club in Riverview, Florida. While leaving the green I looked and a Bobcat came trotting across the fairway. I couldn’t believe it. This was the first time I saw a Bobcat down here in Fla.